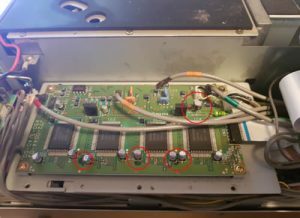 How to repair a TS-850sat carrier board. Plan: Remove old capacitors, Clean PCB, Fit new capacitors. I used this kit to make the repair. 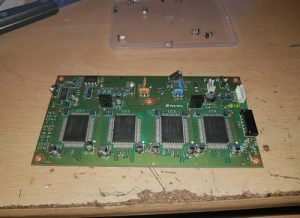 The first task was to remove the casings from the radio and get access to the carrier board which is located under another board which is then under a metal cover. 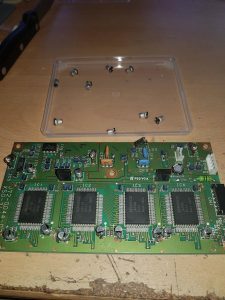 As you can see the leaking caps had started to damage the PCB and also i descovered a previous repair where only a single cap was replaced. Next I removed the old caps and started to clean up the board using some electrical cleaner, cotton buds and a light scraper to remove the blackened coating. Replacing the old caps with the same surface mount style presented a bit of a challenge. The method that worked best was to tin both the contacts on the capacitor and the pads on the PCB. Then while applying light pressure to the cap and applying heat to the solder, swoping from side to side. The caps worked down flat to the board. I then refitted the board and tested operation. All appeared to be working fine and reports over the air were all good. Copyright © 2019 Stephen McBain. All rights reserved.